A famous noodle restaurant chain in China has reached a deal with a family starring in the hit documentary "A Bite of China" to buy out all raw noodle products processed by the family in the coming three years, the website Sina.com reports. 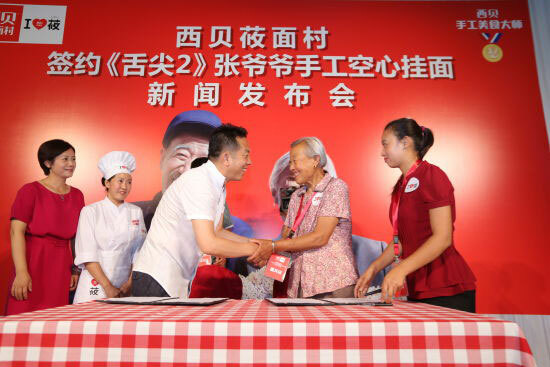 Xibei Youmiancun, a brand affiliated to Xibei Group, will buy all manual dried noodles made by Zhang Shixin's family in the following three years for six million yuan. The Zhang's lives in Zhangjiashan town in north China's Shaanxi province, a place famous for making hallow dried noodle. Their cooking skills have been passed down through generations, while Zhang learned the handicraft from his father at the age of 15. Zhang and his wife Xue Shouji have lived an ordinary life through cooking and selling noodles until the screening of the second season of "A Bite of China", the most successful documentary ever produced in China. The family has registered a brand and hired employees to expand their business. But unfortunately, Zhang Shixin passed away only one week after his episode broadcast in May.